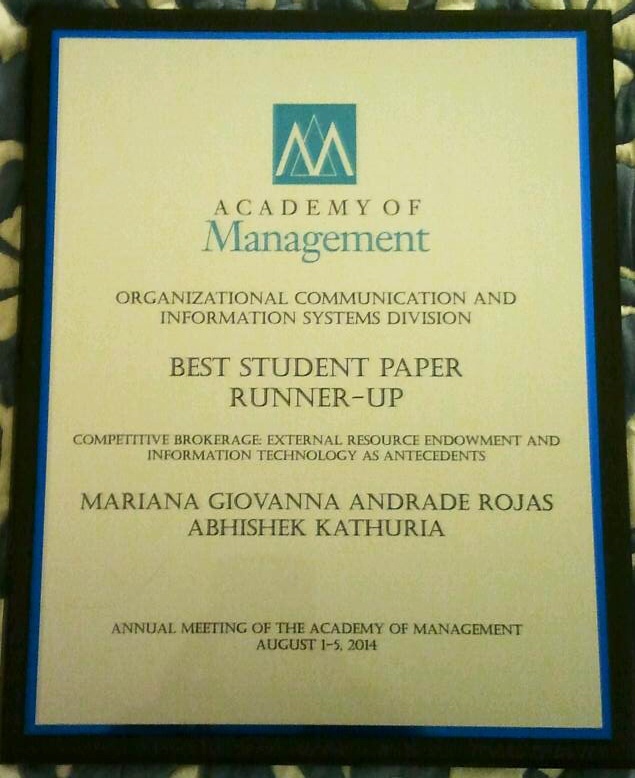 One of my research papers, co-authored with Mariana G. Andrade Rojas, a Ph.D. candidate at The University of Hong Kong, was recognized at the recent Academy of Management Annual Meeting held in Philadelphia, USA. The Academy of Management is the preeminent professional association of management and organizational scholars and its annual meeting draws more than 10,000 students, academics, scholars, and professionals. The paper, titled “Competitive Brokerage: External Resource Endowment and Information Technology as Antecedents” was conferred the Best Student Paper 1st Runner Up Award by the Organizational Communication & Information Systems Division. Having a prominent position in a firm’s competition network is a prerequisite for success in the global and embedded environment of the 21st century. In our study, we assert that IT-enabled information management capability, M&A, and strategic centrality act in differing ways to individually and jointly enable firms to obtain such a position. Specifically, we propose the “competitive brokerage” construct to assess firms’ multi-industry competitive positioning and posit that information management capability acts as a substitute for M&A and strategic centrality to attain competitive brokerage. In other words, we posit that an organization’s information technology, acquisitions of other firms and strategic alliances with other organizations endow it with the ability to bridge multiple markets and successfully compete across them with multiple brands. Analysis of a longitudinal multi-industry competition network supports our assertions. This work offers a novel set of insights to the evolutionary dynamics of network structures literature and the IT business value literature by arguing and empirically demonstrating that in addition to structural elements, firms’ external resource endowment and IT-enabled capabilities influence network positioning. An abridged version of this paper was accepted for inclusion in the Best Paper Proceedings of the conference (approximately ten percent of all papers are selected as “Best Papers” and accepted for inclusion). During our discussions on the value of IT in #hkuiom, I often draw upon examples from my research regarding the role of IT in enabling radical innovation strategies. While the focus of the discussions is not innovation, I use the below mini-lecture video by David Kryscynski, my senior colleague from the Emory Doctoral Program, to provide students a brief overview this topic. The Business Value of IT is a dominant focus of my research and teaching, and this topic draws heavily from the Resource Based View (RBV). During our discussions on the value of IT in #hkuiom, we often talk about IT resources and capabilities. While the RBV is covered in detail during the Strategic Management courses at the MBA level, it helps to provide the students a brief overview of it as part of the IT resources and capabilities discussion. I’ve found the below mini-lecture video by David Kryscynski, my senior colleague from the Emory Doctoral Program, to be very helpful in this endeavor. In the past, I’ve used these slides (The Resource Based View) to communicate the difference between the ‘5 Forces’ view (something that most audiences are well versed with) and the RBV, along with a brief on how competencies fit into the picture. China has become the world’s largest economy. Consequently, it is also one of the world’s largest markets for IT and IT-enabled services. While Indian IT service providers have a large presence in western markets (for example, the Americas provide 60% of Infosys revenues), their presence in China is negligible. Why? This question has troubled the top managements of these firms for many years. Based on the views presented in the recent article, it seems that managers are still far away from finding all the answers to this riddle. The Indian IT industry, which has of late been eyeing the Chinese market, will have to sweat to gain entry here, a top Infosys official has said. via China IT market a hard nut to crack for Indian companies: Infosys China CEO Rangarajan Vellamore – Economic Times. It is often said that the first step to solving a problem is acknowledging it. IT service providers from India seem to be stuck in a time-warp – a bubble of their own making. The challenges they face in the China market are not replicas of the hurdles Indian firms overcame when they entered the US or European markets. These are unique challenges, which call for a unique approach. Entering China requires a China-specific strategy and anything less does not do justice to the potential revenue growth possible from the world’s largest economy. Below are a few challenges that have not been identified in the above article, and some ideas by which these can be turned into opportunities. Language Barriers: Historically, the Indian IT services industry was able to grow in the US and other western markets due to the language advantage – client facing personnel were able to communicate effectively in English. In contrast, China’s market has significant language barriers and a working to excellent knowledge of Mandarin is essential. To overcome these barriers, Indian firms should have ‘localized’ client facing personnel who will be able to understand client problems and deliver feasible solutions. Price-Arbitrage Disadvantage: Another key advantage that Indian service firms have historically had is the low cost of labor in India. However, compared to China, there is no real price advantage of India based software engineers. Once coordination and communication costs are taken into account, it might actually be cheaper to hire talent locally. Many Indian firms have been attempting to do so (for example, Infosys runs a development center in Shanghai), but complain that they are unable to get high quality talent. The reason is not the unavailability of talent – rather, Indian firms are not employers of choice and hence fail to attract the best people. Reputation Barriers: The challenge is not that Indian IT firms do not enjoy any brand recall in China. Indian firms have to actually overcome a negative reputation. Low costs are associated with a perception for bad quality work. To overcome the reputation barrier (in context of both potential clients and potential employees), firms should use a counter-intuitive approach. Use their success stories with F500 companies as a basis for a premium positioning. No Guanxi: Doing business in Greater China is heavily dependent upon the ability to leverage personalized networks of influence, or Guanxi. Indian firms need to hire business development managers and top management who bring not only business acumen, but contextual information and guanxi on board. In line with this argument, it can also be said that the potential productivity gains from IT in China are much more than the potential gains in the US market. Therefore contrary to the ‘common perception’, the IT market in China is not oversaturated a-la the US. However, unlike their US counterparts, firms in China may not be actively soliciting IT services as many are unaware or more likely, unconvinced of the potential benefits. The size of the potential market is huge; the size of the market (of addressable) that is actively looking for an IT service provider is small. Indian IT firms can penetrate the market by offering solutions, not services. This is not a market where sales personnel cannot passively wait for a RFP (request for proposal) to be floated by a possible client. An active sales approach is required. By the same logic given above, the gains per dollar of IT investment in China would be more than the gains per dollar of IT investment and thus easier for IT service firms to create business cases and deliver value. In a nutshell, to crack the China market, Indian IT service providers should re-position themselves as premium players who offer a value-for-money proposition to F500 firms. They hire local talent for business development and client facing roles that are well versed in the nuance of business (and guanxi) in China. Finally, instead of waiting to answer requests for proposals, firms should actively solicit business and focus on growing the market by offering solutions. Most analysts have hailed Google’s recent acquisition of Waze for $ 1.3 billion a masterstroke (a minority thinks that this is going to be a botched overstretch, a la Motorola). [See some nice reports here, here and here and the Waze blog announcement here.] However, there seems to be no agreement on whether this is a strategic M&A, a pure technology acquisition or an acqui-hire. Different folks have differing opinions; IMHO, this acquisition offers Google a few advantages of each of these. A Pre-emptive strategic move: It was reported that there were several suitors for Waze, including Facebook and Apple. By spending a small part of its $50 billion plus cash pile, Google has managed to keep a key technological advancement out of the hands of the competition and this been able to maintain its pre-eminent position in the Maps market. A technology acquisition: By definition, a technology acquisition provides the acquiring firm with a technology or technological knowhow. Waze will enable Google to add a critical element to its Maps technology – real-time, crowdsourced updates. A weakness of all the major players in the Maps market has been the need to spend millions of dollars to periodically update the maps for accuracy in a rapidly changing world (cue the Apple Maps disaster). Waze will augment Google’s efforts by providing a cheaper option for map updates as well potential future monetization through location based advertising. Overall, the Waze acquisition provides Google with several benefits which will enable it to possibly dominate the ‘Lo’ portion of the next big battlefield – The SoMoLo Convergence. 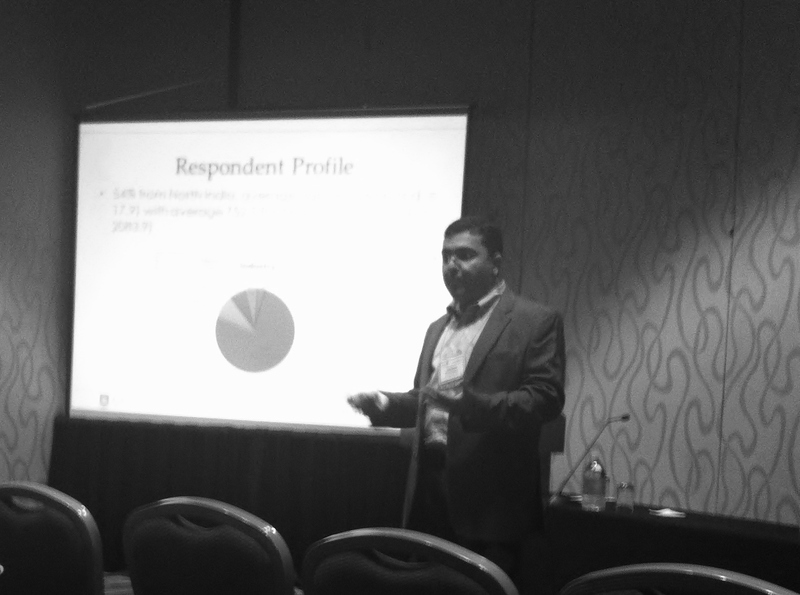 One of my research papers was recently nominated as a candidate for the Best Paper award at the 2012 International Conference on Information Systems (ICIS), the flagship conference and most prestigious gathering of information systems researchers in the world. Titled “Juggling Paradoxical Strategies: The Emergent Role of IT Capabilities”, the paper has been co-authored with Benn Konsynski, the George S. Craft Distinguished University Professor of Information Systems & Operations Management at Emory University. In this study, we assert that in the 21st century, different IT capabilities act in differing ways to individually and jointly enable or impede firms to simultaneously pursue paradoxical strategies as an emergent means of attaining competitive advantage. Such an ability to follow two conflicting strategies at the same time is termed organizational ambidexterity. Firms which concurrently engage in the paradoxical strategies of exploration (or radical innovation) and exploitation (or incremental innovation) are able to address the needs of new and existing customers and thereby attain higher competitive performance. Our research finds that Transform IT capability, which leads to redefining and recreating business practices, strongly supports this instance of ambidexterity. On the other hand, IT Informate Capability, which results in greater information access across the organization, and IT Automate Capability, which facilitates automation of existing business processes, both hamper ambidexterity by ossifying business processes and reducing flexibility. Transform IT capability reduces these harmful effects. Our findings also suggest that a balance of IT Automate, Informate and Transform capabilities enables organizational ambidexterity, hitherto a challenging competitive possibility. Data for the study was gathered from 352 manufacturing firms of all sizes in high growth sectors in India – a setting that provides an exemplar for the world’s enterprises undergoing rapid changes in the 21st century. These findings not only showcase the emergent role of IT in facing the complexities inherent in juggling paradoxical strategies, but also throw light upon previously unexplained variance in IT payoffs in the emerging economy and small and medium enterprise contexts. A link to the paper in the conference proceedings is here. A report by PricewaterhouseCoopers regarding acquisitions by technology firms in Q2 of 2012 reaffirms a trend seen last year – technology firms are making lesser acquisitions, of greater size. Thus Technology Acquisitions are continuing to grow in size (by value), but reduce in numbers. The number of technology deals in the second quarter decreased 35 percent, while total spending increased 19 percent compared to the same period last year, the report said. via a Bloomberg note on the Q2 report, which is found here. Another Bloomberg article on the 2011 report can be found here. Technology companies spent $125 billion in deals in 2011, up 17 percent from the $107 billion spent in 2010. There were 308 deals in 2011, a drop of 21 percent from the prior year.